A bit late to post about it, but we through our annual Eid party the weekend after Eid. The theme was supposed to be floral as I thought it would be fairly easy and I had seen flower pots and watering cans and bright garden ornaments on sale in the £-shop. Only problem was I went back a few days later when I made my mind up and all of the garden products had been replaced with Halloween items which were of no use to me at all. We had a lot of fun doing it, but thought the place looked like a class room afterwards. The sweet table was hilarious. We started right with the table cloth colour and floral napkins and then somehow lots of random colours crept in. Those halal jelly cherries were seriously good, but nobody seemed to like the fruit shaped colourful sweets in the glasses, we ended up saving them in a food bag and giving them to bratty kids knocking on our door on Halloween. I doubt they would have eaten them either. Saying that, one thing I noticed about this party that was different to previous years was the lack of screaming, wailing kids running riot around the house. When we set the food out to eat, it went very quiet and I started to wonder what the kids were doing. I went to check and found Little Lady with the girls and two bottles of cola and their plates of food eating and talking, like normal people. The bots were sitting on the stairs talking and eating their own food. I realsied that the kids had grown up, the girls were no longer groups of 3, 4 and 5 year olds, but a gang of 9-13 year olds, some of which were training to become alimah's or scholar's mash'Allah. The older boys were old enough to leave at home and the rest are computer game mad and spent most of the time sneaking off with their mothers phones and playing games. Everyone bought food and it was fabulous. I was too busy serving and eating to take pictures. Below are tandoori chicken, pakora's, cheese and onion slices, chappal kebab. One of my lovely Somali friends bought a great big tray of the most delicious, moist carrot cake. I served some to my husband after the party and he tasted it warily. He absolutely loved it and kept asking for more of that "Somalian Halwa". I did dress up in this gorgeous outfit from Gul's Style which Kooks bought for me. Not a very good pic, but it was a long tunic with sharara or flared full trousers which look like a floaty skirt.. 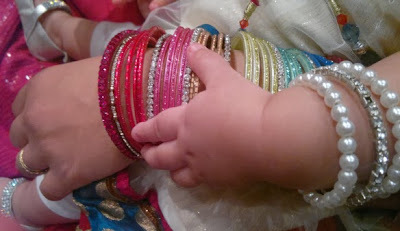 I matched lots of sparkly, colourful bangles which caught Darling's attention. It was a nice party and it went on for hours as people came and went. Insh'Allah next year I'll be used to being a mum of four, will have a better routine and will plan the next Eid party a bit better. 'like a classroom' LOL!!! But I think the wall decor matches your sweet table quite nicely! Would have loved to see the baby's outfit too! I love seeing your baby's squishy little hands! Can Blogging Make You Crazy?